It's almost Easter so that means there will be loads of bunny rabbits, daffodils and maybe even chocolate about very, very soon. 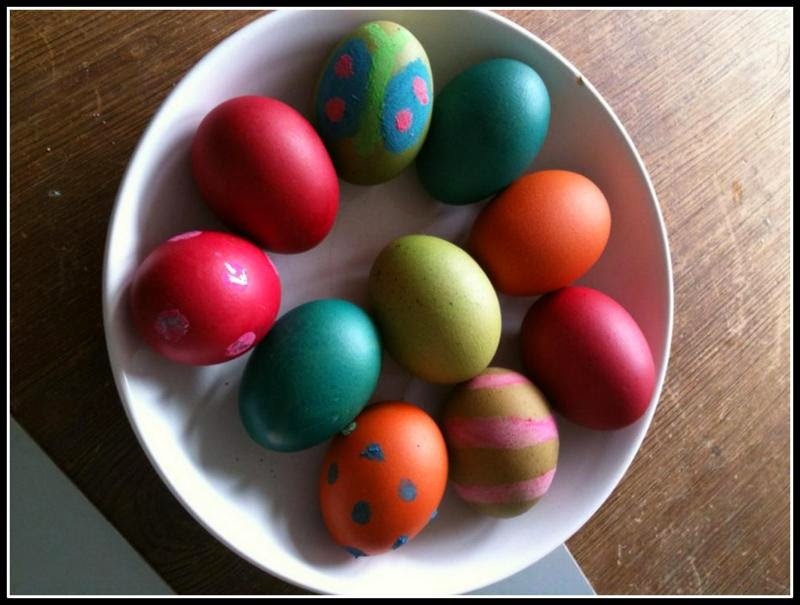 It also means we can get outside and take part in lots of fun activities such as dying and rolling eggs. Arthur's Seat in Edinburgh is a really popular place to roll your egg. But not as popular as a big White House in America where the President of the USA shows 35,000 people what to do!! Look into my eyes, and you will be hypnotised into having a brilliant Easter! I've got loads of ideas for fun Easter activities and places to go. Keep reading to find out more and to learn what on earth my BFF Euan is up to with this red wool and cardboard! The National Trust for Scotland is running loads of fun activities such as the Easter Duck Races at Barry Mill near Carnoustie. £2 per duck. Running from 12-5pm. Or the Muddy Puddle Club at Drum Castle near Aberdeen does garden activities based upon wildlife and nature for kids 5 years and older. £5 per child and £1 per adult. Running 9th and 16th April 11am-12:30pm. There are Easter egg trails being run nationwide at National Trust for Scotland and National Trust properties. You need to get outside and follow the clues to complete the trail and find your prize. With more than 300 in total there is bound to be one near you. This is me enjoying my first proper egg hunt as a teeny tiny 1 year old! For a more nature-themed egg hunt you can head to Provanhall House and Todd's Well Wood in Glasgow's East End on Friday 3rd April. Find as many bunnies hidden in the woods a you can and collect a chocolate prize. Free event and runs from 12-2pm. From Friday 3rd April to Monday 6th April you can visit Britain's best peregrine falcon watch site and see wild peregrine falcons nesting on the side of a woodland gorge. If you complete the peregrine clue trail you'll receive a free Easter egg. At Falls of Clyde Wildlife Reserve, New Lanark World Heritage Site, South Lanarkshire. The Gruffalo is having an Easter party at Jupiter Wildlife Centre in Grangemouth on Wednesday 8th April. From 10am-12noon or 2pm-4pm. It's a free event for kids aged 5-10. 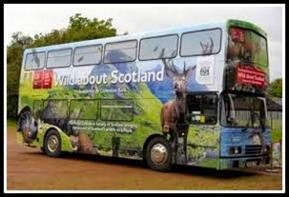 Then on Thursday 9th April the Royal Zoological Society of Scotland's Wild About Scotland bus is at Jupiter Wildlife Centre. There will be water beasties and mini beast hunts from the specially converted double decker bus that aims to connect us kids with nature in our own gardens. Have a look at their blog to see what they've been doing on their huge road trip up and down Scotland. It's also a free event for kids aged 5-10. If you love taking photographs of nature then you should go to RSPB Lochwinnoch Nature Reserve on Friday 10th April. Cameras can be provided and they will upload all your lovely snaps of the new season onto their Facebook page. £7 for non members and £4 for members. Adults are free. 11am-1pm for under 7 year olds and 2pm-4pm for 8 years and older. If you're 6 or older you can get involved in the John Muir Badger Watch on Friday 17th April. At 7:45pm (depending on time of dusk) you can join the rangers to celebrate John Muir's birthday and watch the badgers. Badger are nocturnal- a fancy word that means they wake up at night time. You stay inside though so you don't need outdoors clothes. £3 per person (plus £1 per transaction postage fee) . Booking is essential as places are limited (01324 506850). 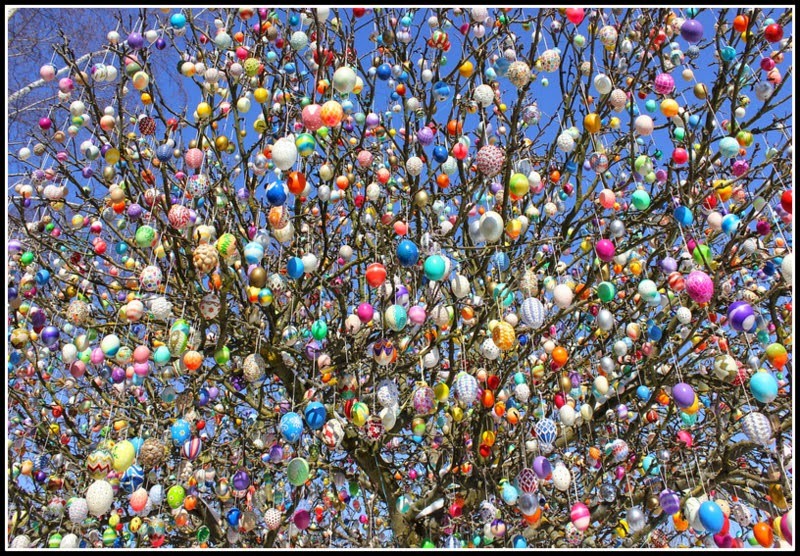 An egg hunt near this tree would be easy peasy! You can get free Egg hunt signs to decorate your baskets or make into badges here. How about making a very cute bunny card with a wee pompom tail? All you need is some card, some paper and paint/crayons, an old cereal packet (or a fancy pompom maker like Lulu has) and some wool. First you need to make a pompom tail. Get an adult to cut 2 small rings about 4cm across at widest point from cereal packet. If you've got a pompom maker just follow the instructions to make a small pompom about 4cm in size. Wind the wool round and round to make a pompom (look here to get more help on making pompoms). Next, paint or draw a lovely bright picture on some paper. When it is dry, draw the outline of a bunny on the back of this and cut out the bunny shape. Glue bunny onto front of your card. Stick the pompom onto the rabbit's bottom with glue. Ta-dah, your finished pompom tailed bunny card! 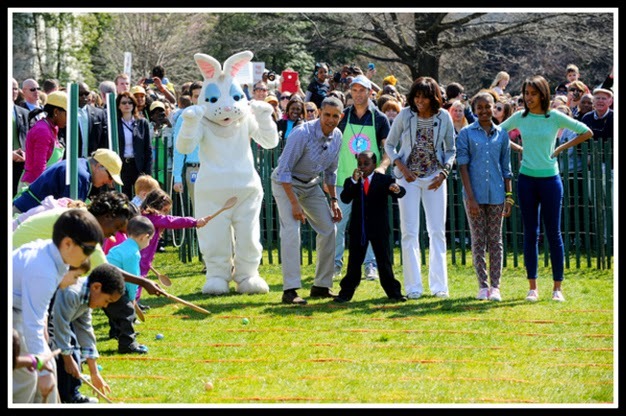 Have lots and lots of fun whatever you get up to this Easter.